Picking the right explosion-proof vacuum, grounded vacuum or anti-static vacuum? Maintaining your business location free of hazardous materials and combustible dust is not an easy task. A common misconception is that sweeping and blowing down the dust with compressed air will better the situation. However, this only makes the combustible particles airborne, thus increasing the chances of a combustible dust explosion. A vacuum is a safest and most effective way to remove combustible dust and hazardous materials, yet not all vacuums are built to handle these dangerous materials. Regular vacuums may cause a spark, however, specialized vacuums exist whose sole purpose is to pick up these hazardous substances. The use of non-sparking materials is essential in the development of an explosion proof vacuum. Every part of the vacuum, from the outer shell to the internal mechanics, must be constructed from these non-sparking materials to ensure proper safety for the user as well as the environment. Many vacuum companies simply add accessories to basic vacuum models and claim them to be explosion proof, but a spark or temperature rise may occur. It is crucial for you to ensure that your industrial vacuum provider can present legal certification that their explosion proof systems are recognized by a national testing laboratory (such as CSA or UL) and can be used in an NFPA classified environment. The certification guarantees that every part of the vacuum, from the inside out, meets the standards for preventing any harmful shock and fire hazards. Filtration quality should not be jeopardized in an explosion proof vacuum. For optimal power and safety, an explosion proof vacuum should be equipped with a series of fine filters to ensure the collection of particles as they move through the vacuum. HEPA or ULPA filters are normally positioned after the vacuums motor to inhibit the movement of combustible dust particles in the air. Quality HEPA filters offer an efficient, effective way to trap and retain the smallest dust particles, down to and including 0.3 microns. A ULPA filter captures even smaller particles, down to and including 0.12 microns. Are you equipped for a Spill Response? OSHA’s National Emphasis Program is specifically looking at companies that handle dry solids; manufacturers’ maintenance plants are also coming under the microscope. When purchasing an explosion proof vacuum, spill response is a feature to take into account. 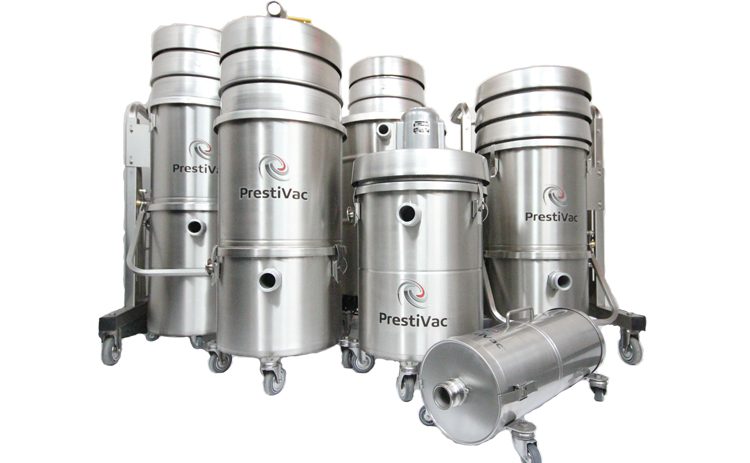 Wet model explosion proof vacuums (available in both electric and air-operated versions) are the ideal solution for collecting flammable or explosive chemicals.